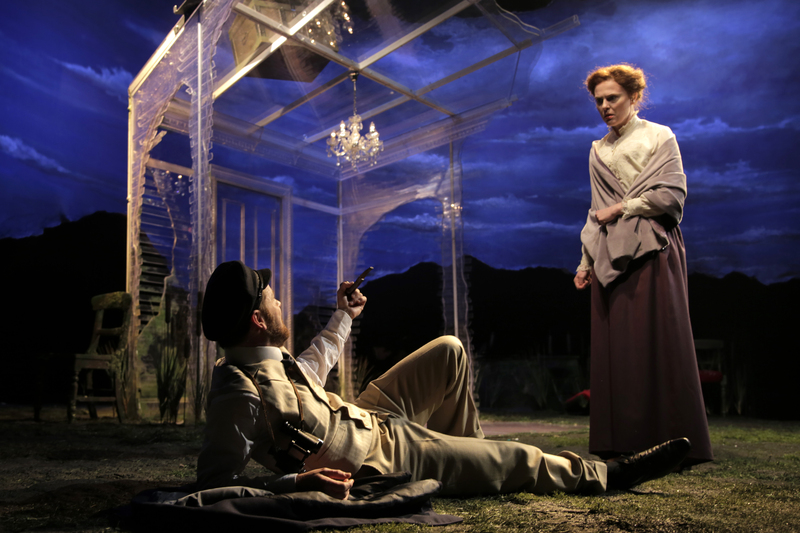 Frank McGuinness’s Hanging Gardens at the Abbey is both devastating and elating: it is not so much heart-breaking as heart-battering, but despite its intensity it’s a play that needs to be seen. This would be true if only because it features five of Ireland’s best actors: Cathy Belton, Barbara Brennan, Niall Buggy, Declan Conlon, and Marty Rea. And one of them – Buggy – gives a performance that I know I’m going to remember for a very long time. As the Abbey’s PR has stated many times, this is McGuinness’s first new play at the Abbey since 1999. It’s also his first premiere in Ireland since Gates of Gold in 2002. And since then all of his original plays have premiered in England, many of them remaining unproduced here in Ireland. 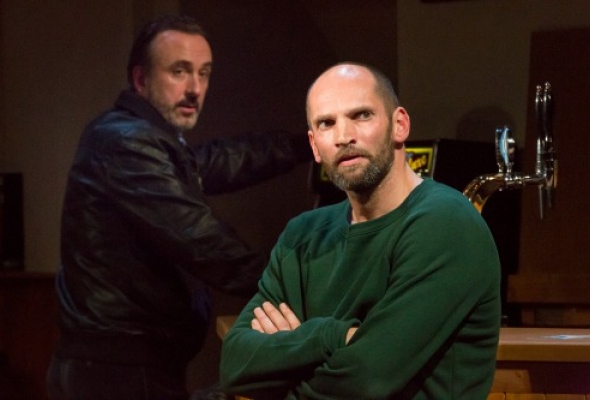 There’s been no better example than McGuinness of the serious problem in our theatre at the moment – which is that many of the best Irish plays of the last 15-20 years have premiered in London, and many of them remain completely unknown in this country. McGuinness’s There Came A Gypsy Riding, for example, should be celebrated as a great and important Irish play. But almost no-one here knows it. So it’s great to see him back on an Irish stage with an original play. McGuinness’s works often feature a character so well drawn that he or she threatens to overpower the rest of the play – from Piper in Observe the Sons of Ulster, to Dido in Carthaginians, to Rima in Dolly West’s Kitchen. Located somewhere between Christy Mahon (the outsider figure who transforms an environment) and Falstaff (a supporting character so vivid that he dwarfs the main protagonists), McGuinness’s unruly strangers are always vulgar, joyous, and disruptive. There’s another such character here – the figure of Sam Grant, an aging writer who, as the play begins, is a subject of intense concern to his wife and three adult children – all of whom wonder how to cope with Sam’s increasingly uncontrollable dementia. As played by Buggy, Sam is mischievous and vicious, terrified and childlike, at turns enthralling and appalling. He harasses, bullies and belittles his family – and while some of that behaviour may be explained (but not justified) by his suffering from Alzheimer’s Disease, his abuse of his family has clearly been carried on over many years. As a result, none of his children has been able to form a loving relationship; none of them seems able to express the love that they all so palpably feel for their parents. The performance by Buggy takes these varying and sometimes contradictory states and makes them cohere. Much of that achievement is possible through his use of voice. At times his lines are delivered with a sing-song quality that contains both swagger and complacency: we sense that this is a man who has a powerful imagination but suspect that there may be an uncertainty or an insecurity in there too. At other times, Buggy’s voice is intense and full-bodied, making clear why his children seem somewhat frightened of him. Yet there is a gentleness too, a kind of mischievous waver that reveals Sam’s enjoyment of his own erudition and imagination. The performance thus acts as a fascinating counterpoint to Owen Roe’s Lear at the Abbey earlier this year – and indeed to Paul McGann’s Undershaft in Major Barbara. Whether by accident or design, the Abbey has given us three very powerful portraits of flawed but irresistible father figures this year. As ever with McGuinness, the risk of having such a strong character is that other roles may seem less interesting by comparison. In this play that potential problem is compounded by the fact that the three adult children are trying desperately to restrain themselves: to hold in their shock at their father’s deterioration, to resist the anger that has obviously been stored up over many years, to hold themselves together at a time when the person who has anchored them to life is leaving the world. So these are roles that demand an ability to convey a sense that there is much more going on than is evident on the surface. That’s why you need excellent actors in the roles, and I was very impressed by the depth that Rea, Belton and Conlon added to their characters. It was fascinating to notice what the children will and won’t look at – the times when they appear to swallow down a thought or feeling – the times when they have no choice but to look away. There’s some lovely, subtle direction here from Patrick Mason. As the matriarch of the family – and as a successful author in her own right – Barbara Brennan’s character follows in a long tradition of strong McGuinness mother figures. Like her husband, she’s full of contradictions, caring more for her garden than her children, yet appearing willing to sacrifice her own well-being for her husband. Brennan resolves those contradictions well, showing us the tension in her character’s body through a stiffness of movement and a vocal restraint that suggests that she’s only just keeping things together. This results in a very moving performance, and the creation of an intriguingly complex figure. Becuase the play set in the garden of a Donegal house, it will immediately call to mind Brian Friel’s 1979 Aristocrats – a portrait of a family damaged by an authoritarian father-figure who, like McGuinness’s protagonist, suffers from dementia (though in Aristocrats the father appears on stage only once). It also seems to draw on other great Irish plays. As a storyteller and beloved tormenter of his family, Sam seems to owe something to Tom Murphy’s Mommo – another artist-figure whose loss of memory drives the play forward. With its clash between two writers – one a populist success and the other a respected author – it reminded me of Friel’s massively underrated Give Me Your Answer Do! With its focus on a flawed artist-figure, it seemed to be drawing on Kilroy’s The Shape of Metal and Friel’s Faith Healer. And with its characterisation of a family that can express love only by tearing itself apart, it occupies the emotional territory that has been mapped so rigorously by Tom Murphy in Whistle in the Dark, Famine and The Wake. All of this might sound as if the play is derivative or unoriginal but, on the contrary, these resemblances suggest that McGuinness is pushing his work to a new level, measuring himself against Murphy and Friel to a far greater extent than he’s ever done before. Watching the play, I felt as I did when I first saw Enda Walsh’s The Walworth Farce: the excitement of knowing that a writer I’d already admired had developed in a way that built on what had come before, but which was also excitingly new. Among the things I most admired about the play is its emotional honesty. I found myself thinking several times of Shaw’s response to O’Casey’s Silver Tassie – which GBS had described as a “hell of a play – literally”. McGuinness gives us a literal hell, unflinchingly exploring what it feels like to know that you are losing your mind, to know that you are dying. He also shows a genuine bravery in representing the attempts of a family to come to terms with the death of one of their own. So many of McGuinness’s observations feel as though they’ve been excavated from some very personal space in his own imagination: his characters’ emotions are incoherent, chaotic, confused – and for all of those reasons feel absolutely authentic. This made the play – for me, anyway – very difficult viewing: I’ve never been quite so relieved to reach an interval as I was when I saw this. 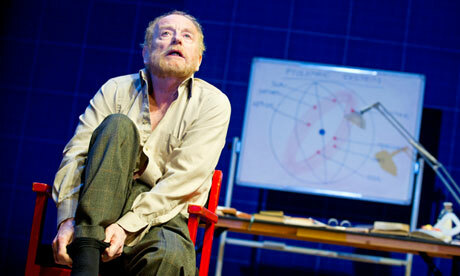 But that was because the play had captured truths that I’ve never seen represented so clearly before. The truths are uncomfortable and undeniable and necessary. McGuinness has found a way to think about the death of a family member that seems as signficant as Robert Lepage’s Dark Side of the Moon. In that play, Lepage suggested that the loss of a parent is like occupying the far side of the moon: the earth is there but no longer visible to us – and all we see instead is the vastness of an empty, infinite space. McGuinness does something similar, especially in the play’s final image, when he (and Mason) capture the vertiginous uncertainty that death evokes in all of us. 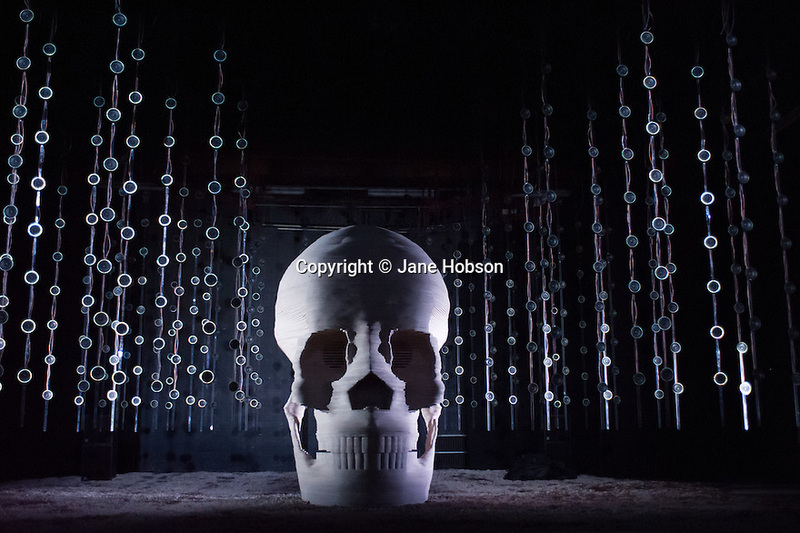 There’s also an important link with McGuinness’s work on The Dead, which played at the Abbey last year. One of the ways McGuinness allowed Joyce’s short story to function on the stage was by theatricalising its use of music – and its musicality. He did that by drawing carefully from the works of Thomas Moore. Here, McGuinness again uses music, this time featuring (of all things) a song from The Mikado half-way through the first act – which is sung by Buggy and Rea. I’ve written a few times already about the use of music in Irish theatre – something we’ve seen in Shush by Elaine Murphy and The Night Alive by Conor McPherson already in 2013. I worry slightly about the frequency with which this technique is used – often enough now to be called a trend. But in The Hanging Gardens, McGuinness shows how music offers the only way for father and son to be fully honest with each other. In the beauty and simplicity of the voices, this moment recalls a scene in Juno and the Paycock in which Mary and Juno sing Verdi’s “Home to Our Mountains” together – something they do so beautifully that they transcend the indignity of their environment. We sense from McGuinness’s inclusion of this song that the family have unseen levels of emotional and intellectual depth, that they have an appreciation of beauty, an attachment to each other, a wicked sense of how to derive humour from the juxtaposition of the serious with the apparently trivial. This scene doesn’t have the show-stopping impact that the dance in Friel’s Lughnasa had back in 1990. But as a moment that allows for an intensity of focus from the audience, McGuinness’s use of this song bears comparison with Friel’s iconic set-piece. Both Friel’s play and McGuinness’s were directed by Patrick Mason, of course – and one of the pleasures of seeing The Hanging Gardens is to be reminded of those great nights at the Abbey in the 1990s when Mason produced or revived so many marvelous Irish plays, from Lughnasa to Observe the Sons of Ulster to Constance Wilde and By the Bog of Cats. It’s great to see Mason back directing new writing on the Abbey stage. And as an aside let me mention that Marty Rea has a very beautiful singing voice. None of the statements above is intended to suggest that the play is in every respect perfect. I think some viewers may find that the family’s second act resolution of their conflict happens too easily. That scene made emotional sense to me, but I think some may find it too sharp a turn in the play’s direction. And I also suspect that some may have difficulty with a long scene in the first act in which each of the four family members in turns confronts – and is upset by – the father. This sequence feels almost intolerable, not only on the grounds of realism (it eventually feels predictable – when we see one character appearing on stage we know they are next in line for an abusive confrontation with the father), but also because these confrontations are so unrelenting that it becomes difficult to stay with the action. I suspected that we were intended to see the scene as (perhaps) not the real world but as a mixture of reality with Sam’s imagingings. But in any case the scene is emotionally exhausting. Yet this is indisputably a major new Irish play, and an important moment also for McGuinness’s status within Irish drama – reaffirming his centrality and importance to our theatre. The production is also very well designed. Michael Pavelka’s garden set mixes the dark green of the lawn with vivid, bloody reds, producing an atmosphere of calmness that seems ready at any moment to bleed into chaos. He also places a sundial on the back wall, which, under Davy Cunnigham’s lights, causes time to shift confusingly, adding to the strangeness and intensity of the play. Finally, I’ve already praised Denis Clohessy’s sound designs in Streetcar Named Desire and Dusk Ahead but I again must say how good his work is, both in terms of his presentation of birdsong as well as incidental music. So far the play has been reviewed once, in the Irish Times, where it received only three stars and a fairly mixed response. Well, everyone is entitled to an opinion, but I hope that such views – and in particular the three stars – don’t discourage people from going to see this. If you value playwriting that is brave and honest – if you appreciate world-class design and courageous acting – if you believe that theatre has to be painful before it can be healing – then you should see this play. Better yet, bring three or four people with you. I think we need to support this kind of work, to make sure that we don’t wait another 14 years to see a new Frank McGuinness play on the Abbey stage. You can find out more about the play on this interesting Youtube clip from Frank McGuinness. The Abbey website also has interviews with all the cast. Choreographed by Jessica Kennedy and Megan Kennedy, the piece is performed by five dancers who also sing and play musical instruments – so one of the things that immediately impressed me was not just the virtuosity of the performers, but also their versatility across different disciplines. A score is played over the PA system, but it’s accompanied by a live cellist (Zoe Reardon) who sits stage-right for the duration of the performance. It quickly makes sense that the company has chosen to include that most sensuous of musical instruments on stage: this is a very passionate and (to use the word again) sensuous performance. As the title implies, Dusk Ahead explores ideas about light and darkness, and/or sight and blindness. It’s about borderlands or (to use one of academia’s worst clichés) liminal spaces: places of transition where rules can temporarily be set aside or reinvented. It explores ideas of sight and blindness in many ways. The performers often move blindfolded or with their eyes closed, for example – and there are some occasions when they are able to synchronize their movements despite being unable to see each other (as for instance when three of them perform with their heads in boxes). And much of the performance is carried out in very dim light. Twilight is thus represented not just as a period during the day, but also a metaphor for how we see the world (evoking ideas about Plato’s cave etc). Ultimately the performance seems to propose that blindness (metaphorically) can offer a deeper kind of sight – that what appears to be weakness can instead become a kind of strength. If that seems to put us in the territory of Sophocles’ Oedipus, the comparison is apt – since this has a mythical or ritualistic quality to it. And it’s a quality that’s still lingering in my mind, more than 14 hours after having seen it. There are also moments of aggression too, as when two of the performers are blindfolded and forced to wrestle with each other. There’s a sense here in which violence comes from the impotence of being unable to see the world clearly enough. As you might expect, given the theme, the quality of the design is very impressive. Sarah Jane Shiels’ lighting does not just illustrate the performance; it becomes a significant element of the performance (in a way that can be contrasted fruitfully with the opening of Germinal) And set and costume design by Sabine D’Argent likewise is not just the context for the performance but adds to the working out of the core ideas in the production. And Denis Clohessy’s score and sound design are also massively impressive (following on from the terrific work he did with the Gate’s Streetcar). Anyone with even the slightest interest in design needs to see this show. As I’ve said, then, this is surprisingly passionate: it moves freely from eroticism to aggression and sometimes blurs the distinction between the two. Both musically and in terms of the movement, it is also very beautiful at times. It’s sometimes ugly too, but never coarsely so. As I walked away from the Project Arts Centre, heading towards the Peacock to see The Events (about which more later), I listened to the other audience members who’d been to the show. “I really liked that,” one of them said. “I mean, I feel like I’d need a Master’s degree to understand what was going on, but I really liked it”. Well, I don’t think anyone needs any kind of prior qualifications to go to this – and it’s not important to feel that you understand all or even any of it: it’s best simply to experience it. But the point is that everyone coming away from this show seemed much calmer and happier on the way home than they’d been coming in. The performance is on at 6.30 on Thursday and Friday and at 6.00 on Saturday and Sunday of this week. It ran for about 75 minutes when I saw it (that is, by the time I left the theatre it was 7.45). So if you’re seeing The Events or Riverrun or any other show that starts a bit late, I’d really recommend this. And indeed it’s well worth seeing in its own right. The video below gives some sense of how the performance is staged and is worth a look.